This is Weekly Update #26 with more Card Crawl news. Last time i was posting about the final design of Card Crawl and that we were pretty close. Guess what, we weren’t. After some serious analysis of the Gamedesign we came to the conclusion that the design does not achieve what the initial vision for the Game was. As written in Weekly Update #24 the original vision for the Game was (and still is) to create a Dungeon Crawler Card Game that takes inspiration from Hearthstone and Scoundrel. But the game we designed until this point wasn’t either one of those. This is why we let the old version die completely and started from the beginning. Our new version now is a way better attempt of merging these two games into a fresh new idea. One thing though we had to scrap also is the idea that we could work out the design with just a regular card deck. Even though we had to make some compromises there we have a very solid game now. The goal of the new design is to work through a deck of 54 cards and collect as much gold as possible without dying before all cards are played. The new design is based on a few simple ideas. 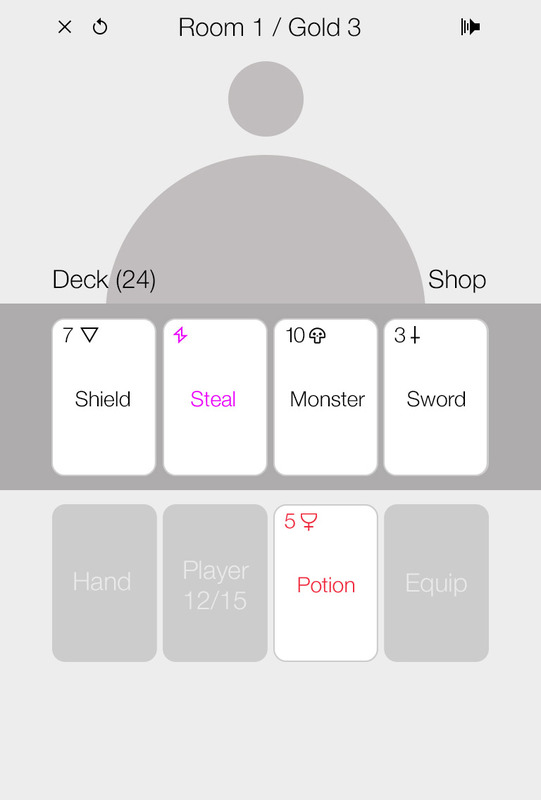 You get a deck of cards consisting of a fixed amount of Monster-, Sword- (Spades), Shield- (Clubs), Potion- (Hearts), Coin- (Diamonds) and Specialcards. The deck gets shuffled and 4 cards are dealt to the table. The player has 4 „slots“ to place cards from the table: Lefthand, Player, Righthand and the Backpack slot. In order to use any of the equipment or special cards the player needs to place these in one of his hands and can play them from there. Monster cards deal damage to the player, these cards need to be placed on the player slot or a shield card. Once three cards from the table are played the room is complete and three new cards from the top of the deck a dealt to the open table slots. Sword cards can attack monster cards directly on the table but get consumed by this action. Shield cards can be placed in the hand slot and reduce the incoming damage of any monster card. Potions work in the same way, once placed one of the hand slot they are used to refill the player health. Coins work a bit different. When they are place in the hand or backpack they stay there until the room is cleared (3 table cards are removed). If the room is cleared coin cards and empty potion cards get removed automatically. Sword, Shield and Special Cards are permanent and until they are consumed they stay in the player’s hands. The backpack can hold any card besides the monster cards. There are two other options to deal with the incoming cards which are to redraw the 4 table cards (before interacting with any of them), which costs 10 gold and to sell equipment cards for additional gold to the shop. This is where the scoring of the game gets interesting. In order to get a good score the player needs to collect as much gold as possible. But the coin cards are limited to a total of 64 Gold. To gain more gold it’s necessary to sell equipment cards to the shop. This means that the more equipment the player can sell the more gold he gets, but also the more difficult the overall game will get, because of the missing equipment to deal with the monster cards. To make this general design more interesting the special cards are introduced. The special cards are the dynamic part of the game. In the first version there will be 20 special cards in total. In each play through 5 special cards are shuffled into the deck. Special cards take a lot of inspiration from Hearthstone and can do various things. For example one of the basic special cards is „Vanish“. Vanish can be used to leave a room at any given point. The card „Swap“ will exchange the card values of the selected card with the one adjacent to it. Another example is the card „Frenzy“ which will enable the player to use a equipped sword card two times. The 20 cards (without spoilers) are: Sap, Exchange, Morph, Steal, Vanish, Confuse, Swap, Leech, Potionize, Buff, Betrayal, Swipe, Lucky Shot, Killing Blow, Sacrifice, Reflect, Frenzy, Bash, Midas Touch and Trade. 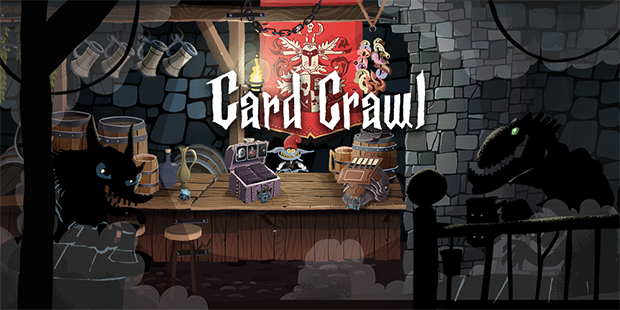 We will integrate two modes for Card Crawl, one where 5 special cards are randomly chosen from the pool of unlocked cards and one mode where the player can choose 5 cards from the pool to create his own mini-deck. Special cards introduce a lot of variatey and it will be very intersting to see which combinations of cards will be the best to create good scores. As we have hinted several times before we will work with another special guest artist on this project. This time we could convince the fabulous Max Fiedler aka Mexer to help us out with his amazing art style. 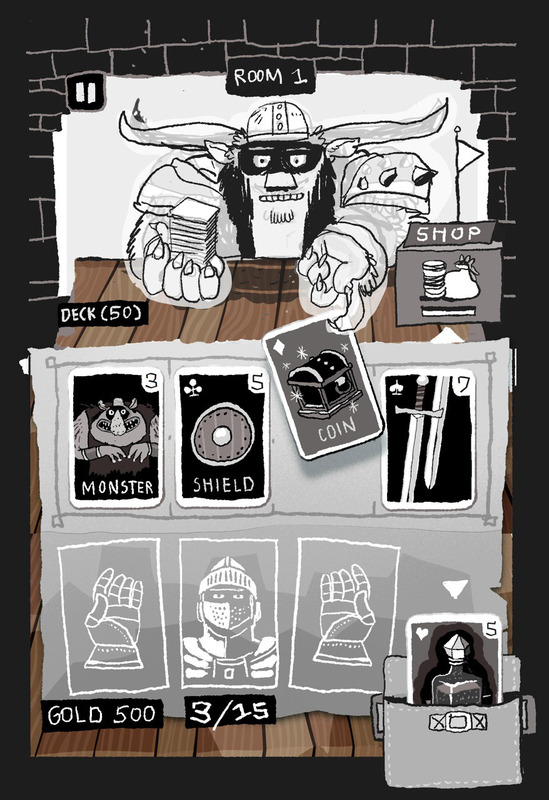 To finish this post and leave you with a little teaser, here is the first draft of the graphcial design of Card Crawl. Have a nice Weekend!